He comforts people when they need it the most. When a patient at a hospital for veterans passed away recently, one of the doctors turned to his colleague to break the news. And his colleague responded the only way he knew how. "Tom looked up at me and meowed," Dr. Blake Lipscomb recalled to Today this week. 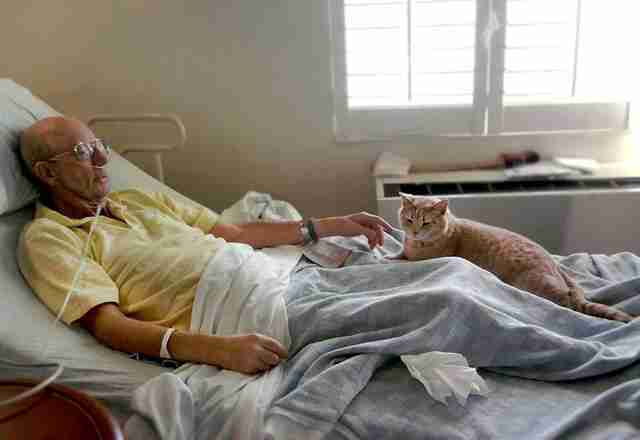 Yes, Tom the cat had known the patient well. "He had been with the veteran and his family at a time that was hardest for them," Lipscomb explained. "Doing exactly what we wanted him to do - to help make a more low-stress, homelike environment." At the Salem VA Medical Center in Virginia, where veterans receive long-term and hospice care, death will occasionally darken a doorway. Which is why it's especially important to have someone living there who's very good at brightening the corners. Like Tom, a former shelter cat who is now an official caregiver at the hospital, offering companionship, counseling ... but please, no cuddles. Tom doesn't like to get all touchy-feely, but prefers instead to curl up alongside a patient. In fact, even hospital staff know when Tom's too busy for chitchat. "Tom doesn't always like to have his picture taken," Shelby Benois, a hospital spokesperson, told The Dodo. "When he quickly ran out of the room, I found that he was headed to 'work' and I knew that he had a job to do. When he's working or busy visiting, I don't bother him for a photo op." But Benois, like colleagues and patients, has a healthy appreciation for Tom's vocation. "Tom seems to have a sense when someone may need a little extra comfort," she explained. "Sometimes it is the patient who needs him the most but often it can be a family member. "He can spend hours with one patient or just stroll down the hall and visit with many. He has become a very important member of the health care team and certainly knows his role as a comforting caregiver." 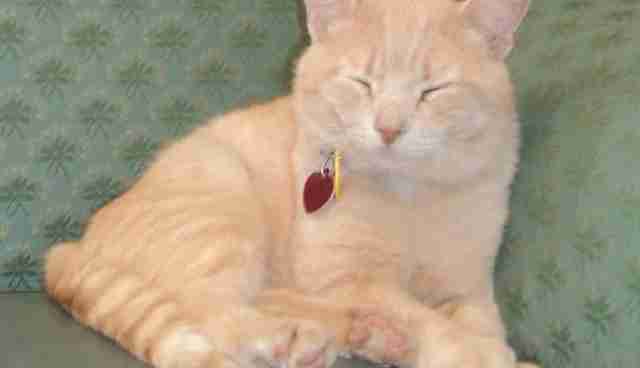 Of course, we've seen cats of all stripes - from hero cats who save families from house fires to therapy cats who have a kind of sixth sense when it comes to predicting seizures. But no cat quite like Tom, who skips nimbly from room to room, cozying up to people who could use his tender ministrations. And, as we've seen time and time again, pets are naturals when it comes to connecting with humans who need them just at the right moment. In an article published by the U.S. Department of Veterans Affairs, a patient's wife described one particularly poignant example of Tom's peerless bedside manner. 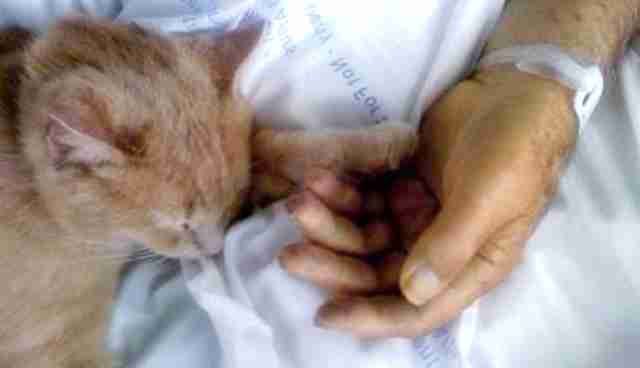 Realizing the army veteran was dying, Tom leapt onto his bed and placed his tiny paw in the patient's outstretched hand. "It was a beautiful passing," Elizabeth Gehlert said. "And that cat is the one who made it happen."